After the circus that was the free agencies of Manny Machado and Bryce Harper's -- which ended with Machado in San Diego and Harper in Philadelphi -- Mike Trout went out and signed a 12-year, $430 million contract last week to ostensibly remain an Angel for the rest of his career. It ended the biggest free agency sweepstakes in MLB history before it began, and baseball's best player is remaining in Los Angeles. Despite Harper's efforts to bring Trout to Philadelphia to join him, Trout actually said that the experience that Machado and Harper had turned him off to the free agency process. "I kind of saw what Bryce and Manny went through and it drew a red flag for me," Trout said, via The Athletic's Fabian Ardaya. "I talked to Manny and Bryce. It was a tough couple months in the offseason. They put it perspective in my mind. I obviously want to be an Angel for life. That was a big key." Machado and Harper were free agents up until mid-February, when Machado signed a 10-year, $300 million deal. 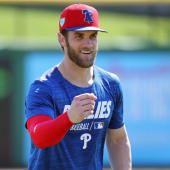 Harper signed with the Phillies for 13 years and $330 million a few weeks later. The entire offseason was about the two players, something that it seems Trout wanted to avoid. "If we hadn't gotten a deal done it would have been tough for me," he said, per The Athletic. "I obviously wanted to be here. I said I want to deal with it now. If not [I'm going] to explore free agency. I didn't want to go through the next few seasons thinking 'am I going to get a deal or not?'" On Sunday, Trout had his official contract introduction. At the introduction, he mentioned playing on the East Coast (with the Phillies, which Harper lobbied for very publicly) to a chorus of boos. He added about Anaheim: "This is my home."